Mall food courts have long been known as a practical wasteland for good eats, but the Westfield Santa Anita has been working for the past year to bring a food hall that emulates a true Asian street market or hawker center. The new Food Alley, which includes soup dumpling maestros Din Tai Fung, hopes to change that. 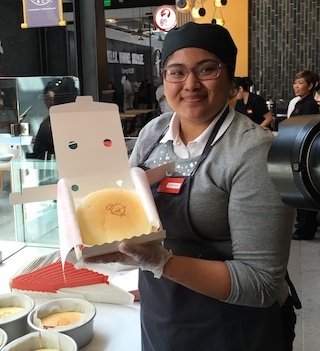 Uncle Tetsu&apos;s Cheesecake, which has a cult-like following across Asia, has secretly been in a soft-open phase the last few days. The Westfield location is their first location in the mainland U.S., and lines have already clocked up to two hours long. Uncle Tetsu&apos;s cakes are known for being airy light and pillowy soft—the opposite of your typical dense and very sweet New York cheesecake. For now only the original flavor is available, but head baker Lydia Chen told LAist that they plan on bringing coffee, matcha, and chocolate into the fold. The coffee itself was our personal favorite. What makes this location unique among Uncle Tetsu&apos;s is the array of pastries and cookies developed by Chen specifically for this location. Especially delectable is the Ooey Gooey, a thin chocolate chip cookie topped with melted marshmallow. 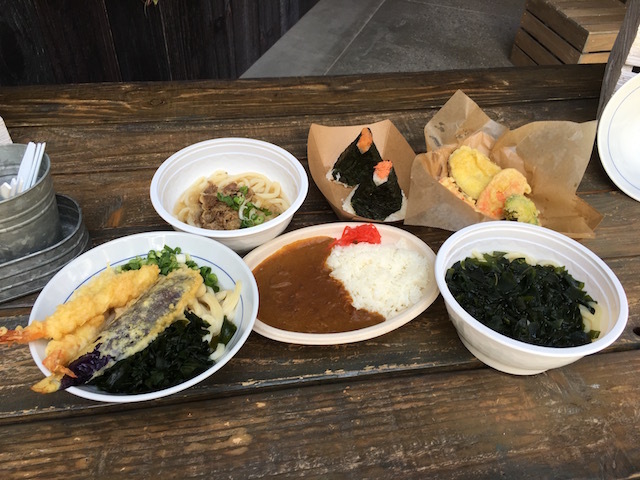 Little Tokyo&apos;s Tsurumaru Udon Honpo has set up shop in Food Alley too, with a more on-the-go menu. Tsurumaru specializes in Osaka-style udon, which primarily features dashi broth and a more umami taste. 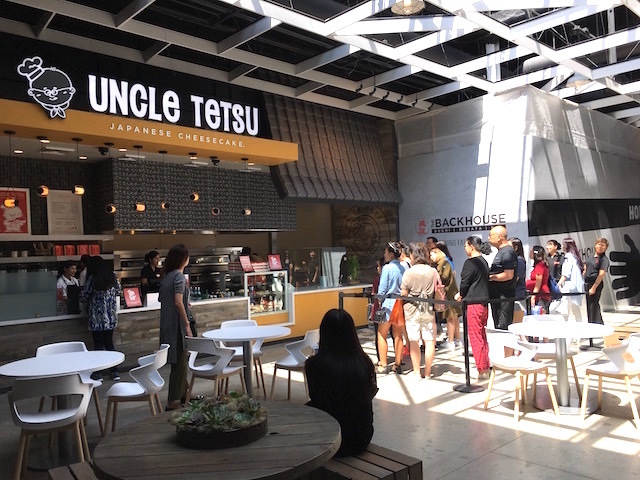 "This location is more reminiscent of a fast food-style udon shop in Japan where a lot of times working people only have 15 minutes to eat and get back to work," general manager Mao Honda told LAist. 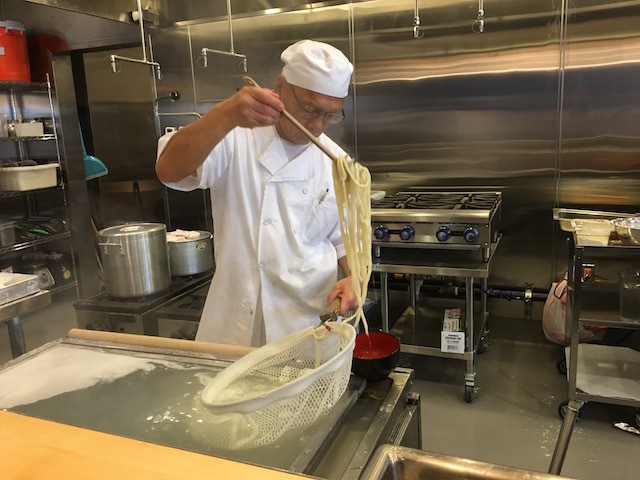 The udon noodles are made right in front of you in their open kitchen and the tempura is not fried until you order it. In addition, Tsurumaru Udon also serves Japanese curry and omusubi rice balls. The udon is very good, with noodles that are perfectly al dente, or koshi. Our favorite was the wakame, or seaweed, udon perfect for those that want a more refreshing, light flavor. Making their brick-and-mortar debut will be Side Chick, one of L.A.&apos;s hottest pop-up restaurants. 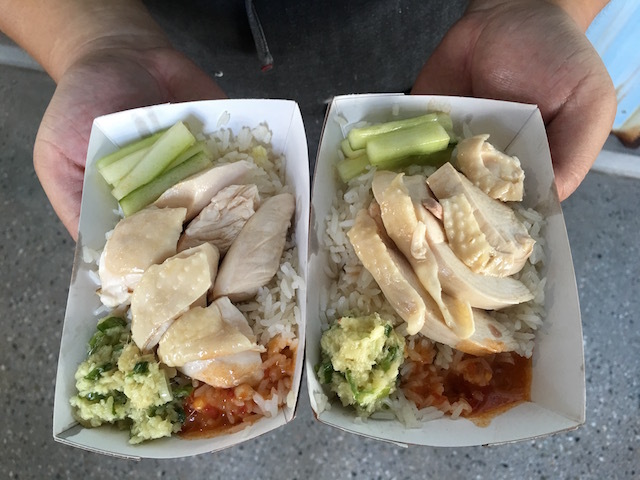 Johnny Lee, formerly of Eggslut, had previously brought Side Chick to Chinatown and Smorgasburg, but has ultimately decided to make the Food Alley his permanent home. Soon to open, you can expect his famous Hainan chicken rice dish (a fried version of it as well), soup noodles, and rice porridge. Food Alley has its grand opening on Friday, but not every spot at the court will be open just yet. Future restaurants and stores include green tea treat shop Matcha Matcha, the pan-Asian Monkey Bar, a new location for the popular EMC Seafood & Raw Bar, and yakitori restaurant The Backhouse. The Food Alley is located in the Westfield Santa Anita Mall at 400 Baldwin Ave. in Arcadia.